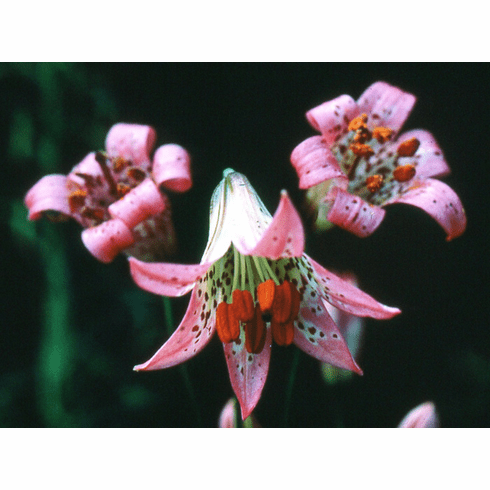 Commonly referred to as 'The Ditch Lily', this lily is found in ditches in the Eldorado National Forest. Similar in flower form to L. parvum, it carries a unique pink coloration. Debate goes on as to its status of being a true species or a hybrid between Lilium parvum and Lilium kelloggii . Finding them in colonies which indicates self sown seed, makes this being a natural hybrid doubtful. Our photo is courtest of the late Orrel Ballantyne who was working on a project to re-classify the lilium species of the West Coast. His feeling as well was L. parvum var. hallidayi was a species, unique and unto itself.